WASHINGTON, D.C. -- For the seventh year in a row, less than 20% of Americans approved of the job that Congress is doing. In 2016, approval averaged 17% for the year, only slightly better than the all-time low average of 14% in 2013. The last time the yearly average exceeded the teens was in 2009 (30%). It wasn't too long ago that a majority of Americans approved of Congress. The terrorist attacks of Sept. 11, 2001, affected approval, which averaged 56% in 2001 and 54% in 2002. Those measures, however, are historically atypical, because they reflect the only times yearly approval averages have reached the majority level since Gallup began asking this question in 1974. In 1992, for example, 18% of Americans approved of Congress, while in 1979, 19% said the same. 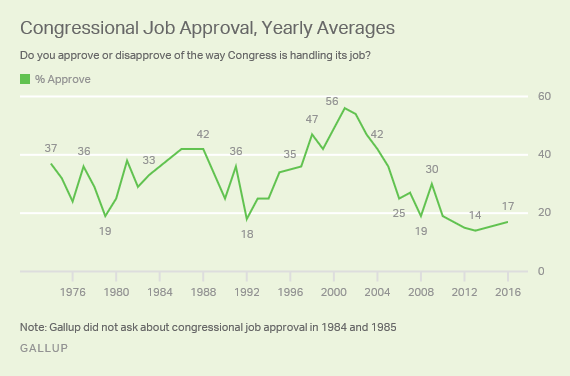 Overall, approval of Congress has averaged 31% since Gallup first measured this in 1974. The ongoing streak of low congressional approval is rooted in bipartisan displeasure with the legislative institution. Republicans may have controlled both branches of Congress for the past two years, but they aren't any more likely to approve of Congress now than when Congress was divided or when Democrats controlled both houses from 2007 to 2010. Since 1992, those who identified with the party in control of Congress have tended to be more approving than those identifying with the party out of power. From 1995 through 2006, more Republicans than Democrats approved of Congress, and in the mid-2000s, Republicans' approval of Congress far exceeded Democrats'. In 2004, for example, 63% of Republicans approved of Congress, compared with 25% of Democrats. When Democrats retook both houses in 2007, GOP support plummeted while Democratic support rose modestly, but enough so that Democratic approval generally exceeded Republican approval during the period of Democratic control that lasted through 2010. In only two years -- 2009 and 2010, when Democrats controlled Congress and Barack Obama was president -- did Democratic approval tower over Republican approval. From 2011 through 2014, with Democrats controlling the Senate and Republicans controlling the House, neither party's supporters held Congress in high esteem. When Republicans took control of both houses in 2015, there was a brief period when GOP supporters were more likely than Democratic supporters to approve. However, that didn't last, perhaps because loyalists were frustrated with the lack of progress on issues of importance to the party. Even with a new president-elect in place to lead a unified Republican Congress next year, partisan views about Congress haven't changed. In December 2016, 18% of Americans, including 16% of Democrats and 16% of Republicans, approve of Congress. 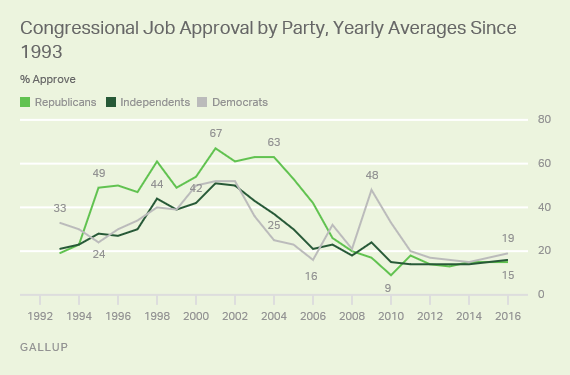 Congressional approval in the U.S., while never high, saw the bottom fall out in the 2010s. Americans have given Congress low approval ratings throughout the decade, possibly owing to the hyperpartisanship and gridlock resulting from divided party control of government, plus perceptions that Congress is controlled by major donors and lobbyists. While disapproval of Congress by party differed, often markedly, in the Bill Clinton and George W. Bush administrations, disapproval has been particularly acute during the Obama years, as both parties have given Congress abysmal ratings. This could be related to Americans' frustration with the seeming inability of Congress to get important things done, and their frequent selection of the government as the nation's most important problem. In the previous two presidential administrations, supporters of the party in power generally were favorable toward Congress, but that has not been the case in recent years. It remains to be seen whether a President Donald Trump, joined by a Republican Congress, will bolster the overall ratings of Congress somewhat by the end of 2017, especially among Republicans. Results for this Gallup poll are based on telephone interviews conducted throughout 2016, with a random sample of 12,258 adults, aged 18 and older, living in all 50 U.S. states and the District of Columbia. For results based on the total sample of national adults, the margin of sampling error is ±1 percentage point at the 95% confidence level. All reported margins of sampling error include computed design effects for weighting. With less than a month to go before the U.S. congressional elections, 18% of Americans approve of the job Congress is doing. Nearly two-thirds of Americans (64%) believe that major donors have a lot of influence on how members of Congress vote, compared with 14% who say the same about the members' constituents.